Touch dry in 1 hour. Apply a second coat after 4 hours if needed. For nterior and exterior use. Blackfriar Multi Surface Primer has been specially formulated to prime and seal soft woods, chipboard, plywood, GRP, MDF, exterior UPVC, ceramic tiles, iron, steel, galvanised and non-ferrous metals (aluminium, brass, chrome, copper). Stir thoroughly before use. Apply one coat of product by brush or roller except on ferrous metals and porous surfaces where two coats are required. 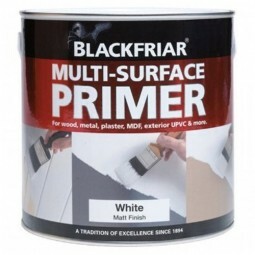 Ensure the surface to be primed is clean, dry, free from wax, grease and oil.